So, I’ve been wearing Max Factor’s old volumising favourite 2000 Calorie mascara for a few days now, and I’m really rather impressed. Firstly, I hate, HATE the smell of the stuff. It’s quite pungent and chemically, a horrible whiff as the wand passes my nose on it’s way to my lashes. It also sports a chunky brush not unlike Benefit’s Bad Gal. 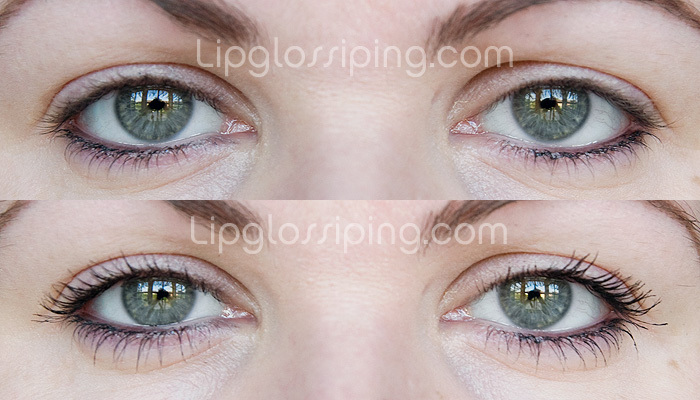 My left lashes (right on the image) always clump a little more than the right. It’s a bit tricky to get to the very outer lashes with this chunky wand, but not impossible. Can’t see too much lengthening or extra curl going on here, but there’s definitely some decent volumising and the pigmentation is a really nice solid black. For the price, I am really impressed. It’s very forgiving to apply – often if I go in for more than one coat, my lashes start to clump whilst I simultaneously begin to curse. I didn’t have a problem at all with this mascara doing that. As a direct comparison to Benefit’s Bad Gal (click link for my review), I really can’t say that Bad Gal is worth spending the extra money on. Bad Gal is slightly blacker, thinner in consistency and feels a little more conditioning to your lashes – but I’m not sure those 3 differences justify spending double the amount of money over this drugstore cheapy. It’s a tough one.